﻿ On April 26, 2012, Taipei Customs Office seized an outbound passenger and his companion who brought with them undeclared US currency $25,800 and US travel check $294,300. The exceeding amount of US currency $5,800 and US travel check $274,300 was confiscated. On April 26, 2012, Taipei Customs Office seized an outbound passenger and his companion who brought with them undeclared US currency $25,800 and US travel check $294,300. 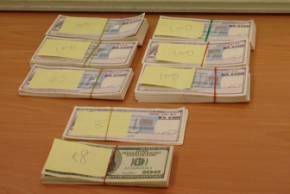 The exceeding amount of US currency $5,800 and US travel check $274,300 was confiscated.